Chris Gleeson, one of our founder members, died after a final struggle with cancer on Saturday, May 19th, 2012. Chris was born in Ottawa, Canada on August 13th, 1931, and educated in Montreal. After gaining his Bachelor’s degree at Loyola College in 1953, he went on to McGill University to study and obtained a MSc in economic geology in 1956. He continued on at McGill to study for a doctorate in Economic Geology-Applied Geochemistry with John Riddell. His work was supported by Kennco, where he met Joe Brummer with whom he would have a life-long association. His thesis, ‘Geochemical studies on the distribution of metals in bogs, lake sediments, tills and glaciolacustrine deposits’ using a powered auger to collect samples to study geochemical dispersion in three-dimensions, was completed in 1960. This was at a time when the geochemistry of glacial materials and derived soils was not accepted as a bona fide exploration tool in Canada, and helped set the science on a firm footing. Many years later, in conjunction with Vern Rampton and Roger Thomas, he completed studies on the distribution of metals and geochemical indicators in peats and saturated sediments in the Kirkland Lake area. These studies, which were complementary to the theory of electrochemical dispersion in overburden, were published by the Ontario Geological Survey in 1986 as OGS Misc. Paper 131. Following graduation, he worked as an exploration geologist in Chibougamau, Quebec, and Wabash, Labrador before joining the Geological Survey of Canada (GSC) in Ottawa in 1962. At the GSC, he worked on the gold deposits of the Klondike, undertaking detailed heavy mineral studies of the stream gravels (GSC Bull. 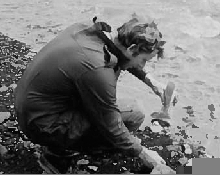 173), and later with Bob Boyle in 1965 on Operation Keno, a regional stream sediment, water and lithogeochemistry surveys. This was in effect a pilot study regarding the use of stream sediments, stream and spring waters, heavy minerals and lithogeochemistry in mineral exploration and was utilized as a model for later exploration by both the private and public sector. It is also noteworthy that the maps (GSC Maps 19-1964 to 31-1964, 45-1965 to 57-1965) and data (GSC Papers 71-51, 75-14, 76-31 and 77-31) from that survey were still being used to support exploration 40 years later in the Keno area of the Yukon. Chris left the GSC late in 1965 to join the newly formed Société québécoise d’exploration minière (SOQUEM) as their exploration and research geochemist. He was responsible for SOQUEM’s applications of exploration geochemistry and it was there that he pioneered the use of the Pionjar portable hammer drill to sample basal tills overlying geophysical anomalies in order to determine which ones were associated with base or precious metals and might merit further exploration (CIMM Spec. Vol. 11, 159-165). His work with overburden drilling techniques led to the discovery of the Louvem Mine East Zone zinc deposit near Val d’Or, Quebec. At SOQUEM he also directed numerous geochemical surveys in Gaspe and the Eastern Townships. He left SOQUEM in 1969, and after a brief association with Bondar-Clegg, the analytical service laboratory in Ottawa, and Fabian Forgeron and Arthur Smith, formed his own company, C.F. Gleeson & Associates in 1970. As a consultant economic geologist-geochemist, Chris worked extensively in Canada, the U.S., and overseas for both industry and governments. He qualified himself as a Professional Engineer (Ontario) early in this period. Besides the World Bank, CIDA, Saudi Arabia Government, Geological Survey of Canada, Swedish Geological Survey, Indian Affairs and Northern Development, Ontario Geological Survey, New Brunswick Department of Mines, Saskatchewan Mining and Development Corporation and Queen’s University, he consulted to over 60 different firms. His overseas work took him to Europe – Ireland, Slovakia, Sweden and Spain; to Malaysia, Jamaica, Columbia, Brazil and Saudi Arabia; and to Africa – Algeria, Ghana, Guinee, Burkina Faso, Niger, Cameroon, Zambia and Botswana. In Malaysia, he designed and directed exploration programs, which led to the discovery of base metals, precious metals, molybdenum, tin and uranium, for example the 100 million tonne Megapour Deposit (Cu-Mo-Au skarn-porphyry). In Burkina Faso, his work with Incanore (Con Salamis and Jacques Beauregard), was material in expanding the extent of the Youga Deposit to where it was an economic deposit. In 1984 he co-founded Kinbauri Gold Corp., a junior exploration company that under his direction completed exploration projects in such diverse jurisdictions as eastern and northeastern Ontario, northwestern Quebec, southern New Brunswick, Nevada, Burkina Faso and northern Spain.. In all this work Chris was an innovator and a stickler for good field practice, ‘how could a survey be worthwhile if the sampling was not done right’. And very suspect of any thoughts that manipulation of data by ‘black boxes’ could replace knowledge gained from careful field observations. An early contribution to the principals of exploration geochemistry was his work as a co-author of the Peter Bradshaw led volume of the Journal of Geochemical Exploration (JGE 4(1):1-213) entitled ‘Conceptual models in exploration geochemistry – The Canadian Shield and the Canadian Cordillera’. For many years Chris worked in association with Joe Brummer and Roger Wallis of the Minerals Division of Canadian Occidental Petroleum in western Canada. The Gleeson-Brummer-Wallis association led to their 1978 paper (CIMM Bull. 81:64-79) ‘Geological Implications of Regional Stream-Sediment geochemical data from South-Central British Columbia’ that won them the Canadian Institution of Mining and Metallurgy’s Barlow Medal for 1978. On the occasion of the 1985 11th International Geochemical Exploration Symposium in Toronto, Brummer, Gleeson and John Hansuld prepared the keynote address, entitled ‘A historical perspective of exploration geochemistry in Canada – the first 30 years’, they were well suited as authors, having participated in much of the activity (JGE 28(1/3), 1-39). In 1987 Chris won a second Barlow Medal for his paper with Denis Sheehan entitled, ‘ Humus and till geochemistry over the Doyon, Bousquet and Williams gold deposits’ (CIMM Bull. 80:58-66), this work resulted in the discovery of the Williams “C” gold zone at Hemlo in 1982. Chris’s accumulated fifty years of geochemical experience was huge. Over those years he worked with bedrock, residual soils, recent soils developed on glacial overburden, glacial sediments, lake and stream sediments, humus and waters. Again with Vern Rampton and Roger Thomas, he conducted a comparative study of various media (Humus, B-soil, C-soil, -250 mesh, -80 mesh, heavy minerals) to determine the most effective media for gold exploration in Eastern Ontario, which was published as OGS Open File Report 5613. Throughout all his work he was always looking for ways to utilize heavy minerals in the search for mineral deposits, whether they be gold, diamonds or base metals. Regional surveys completed by Gleeson in utilizing heavy minerals for diamond and other metal deposits in the James Bay lowlands for KWG Resources identified a large chromium anomaly that upon follow-up led to the discovery of the major chromite deposit in the Attawapiskat River area (Ring of Fire). He was an excellent exploration geologist always utilizing his immense knowledge of economic geology, exploration geochemistry and field methods. He was always driven by curiosity. An example of his early innovative spirit was his use of termitaria in West Africa (JGE 31(3):253-283) to deep sample residual soils for gold exploration, which led to discovery of the Koma Bangou deposit in Niger. Chris was also involved in environmental research, completing a two year in-depth review on the geochemistry of mercury and its environmental impact in Venezuela for a major mining company. Chris was one of the founding members of the Association of Exploration Geochemists, he was our first Treasurer, 1970-72, a Councilor from 1972 to 1974, and a Vice President from 1974 to 1976. He returned to be a Councilor again between 1984 and 1986. He authored numerous maps and papers with the Geological Survey of Canada. He contributed papers to the Association’s Journal of Geochemical Exploration, and the CIMM Bulletin. Chris in total has published over 50 notes, maps and papers with various government agencies and journals. He was a Life Member of the Canadian Institution of Mining and Metallurgy, the Society of Economic Geologists, and the Prospectors and Developers Association. At a personal level we all knew Chris in Ottawa and as a field geologist. He was great company and one always wound up learning something interesting and useful. He will be missed by the exploration industry and his colleagues and friends around the world. He resided for most of his career at Iroquois on the St-Lawrence Seaway where he was able to pursue his hobbies of gardening and golf with the same vigor that he conducted his professional activities. Chris leaves his wife Marion (VP of Public Relations to anyone who has phoned C.F. Gleeson & Associates Ltd), sons Christopher (Karen), Timothy (Alice) and Darcy and daughter Erin plus many adoring grand children.